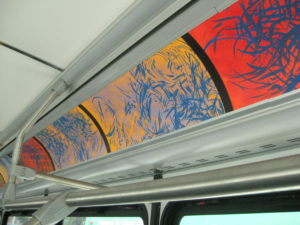 Art on the ART Bus is a mobile gallery on one of Arlington County’s ART public transit buses. 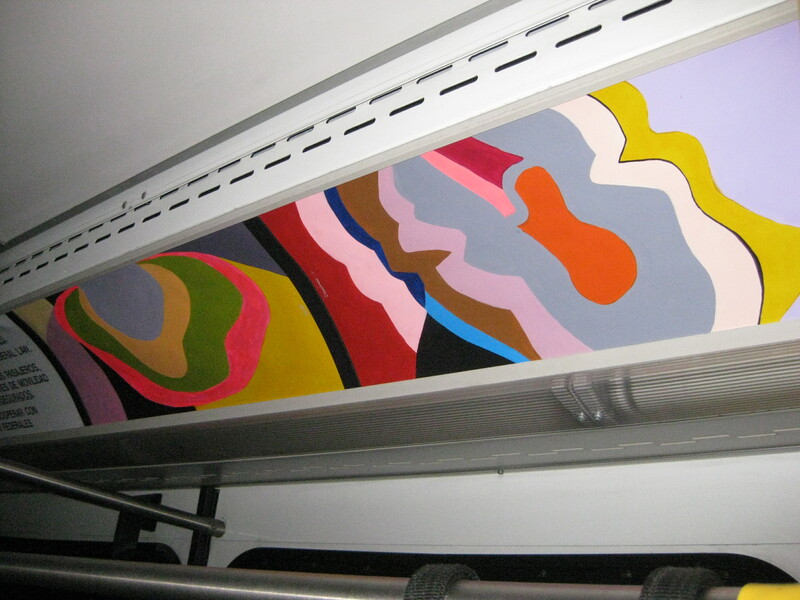 Run by Arlington’s Special Projects Curator Cynthia Connolly, this unique bus features original works of art. 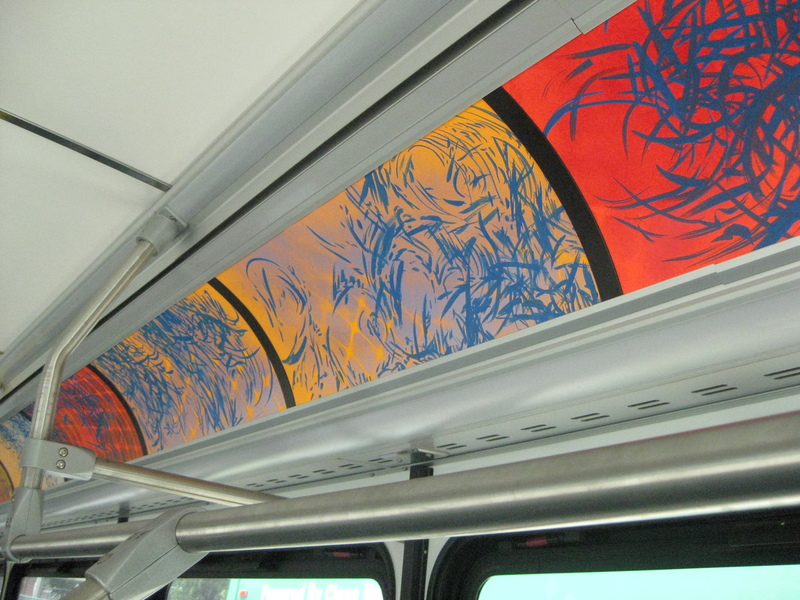 This dynamic connection between public transit and original art makes the commute as exciting as the destination, cultivating a vibrant arts experience for transit in Arlington County, Virginia. 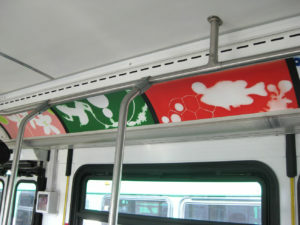 Initiated in December 2010, this bus rotates throughout the different routes available to ART bus passengers. 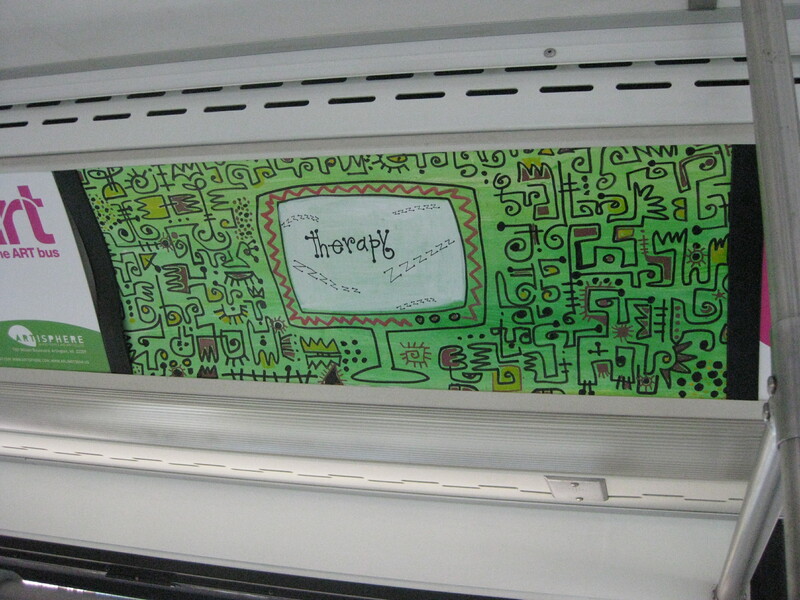 Check out the video above of one of the first Art on the ART buses. Art on the ART Bus is funded in part by Arlington Transit. 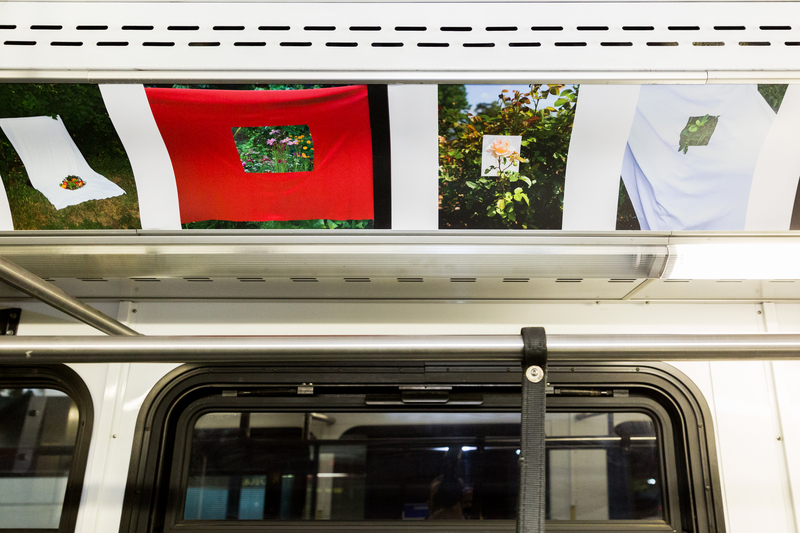 Gail Rebhan – Collecting stories and artifacts representing the immigration, forced migration, and assimilation of a broad spectrum of Arlington residents, artist Gail Rebhan’s powerful photo collages highlight that we are a country of immigrants. 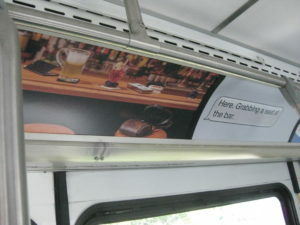 The subjects for the project were identified with assistance from the Arlington County Department of Human Services. 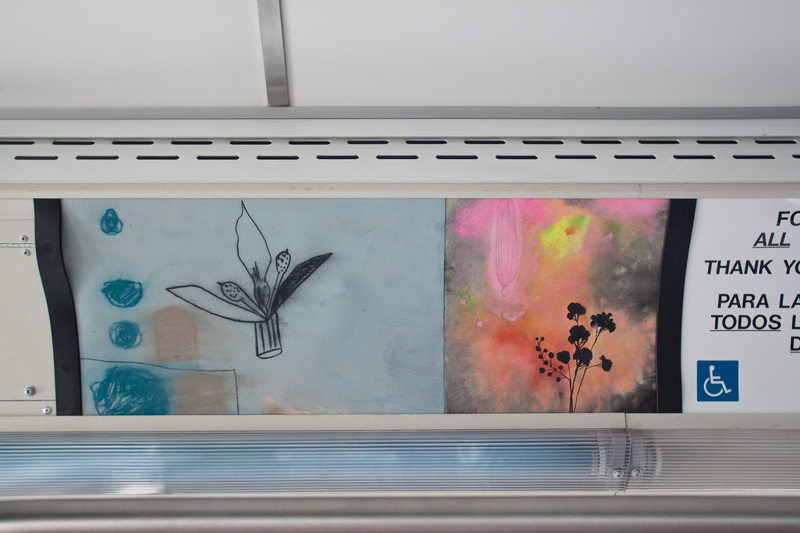 In a rare opportunity, these artworks will be installed inside the Bozman Government building lobby thru Spring. 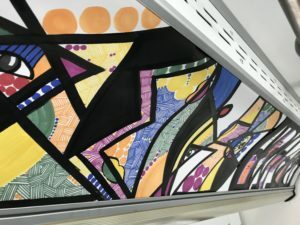 A free opening reception and artists’ talk will occur on Thursday (5:30 -7:30pm), March 21 in the lobby of the Ellen M. Bozman Government Center at 2100 Clarendon Blvd, hosted by JBG SMITH. Anne Rowland – Landscape photographer Anne Rowland made these pictures of Arlington’s Potomac River waterfront. The terrain varies: bucolic forest northwest of Key Bridge, a mysterious woodland just to the south and urban parks such as Lady Bird Johnson Memorial Garden and Long Bridge Park. Further downstream along the Mount Vernon Trail, the shoreline ends at the broad mouth of Four Mile Run. These photos are comprised of multiple images assembled in the computer from both an iPhone as well as a remotely-triggered point-and-shoot camera attached to a 20 foot tall bamboo pole. 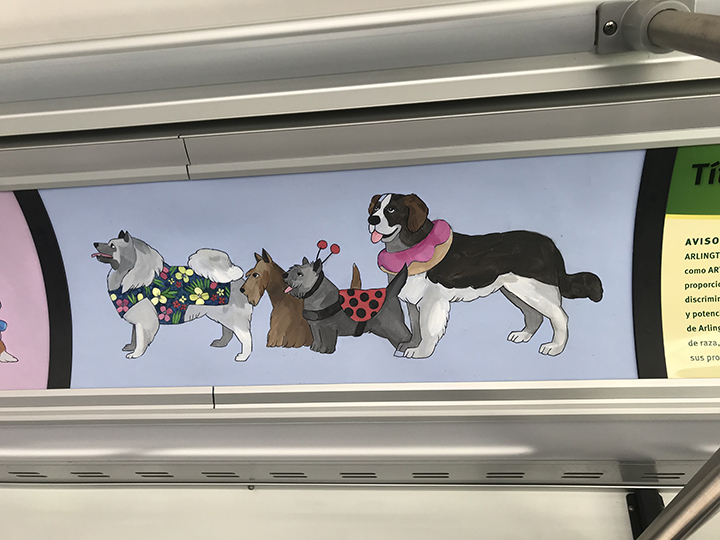 Emily Campbell – Artist Emily Campbell invites you to immerse yourself in her colorful drawings that depict a variety of playfully costumed dogs. This lively parade is designed to foster intrigue for the various dog parades that are sponsored by the Animal Welfare League of Arlington. These four-legged pooches will direct you as you enter the bus and then lead you back out as you exit. 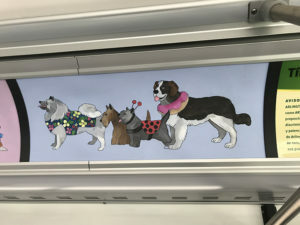 The artist hopes that the spectacle of the parade in her drawings will remind viewers of the love and happy times that animals can bring into a person’s life and to visit the Animal Welfare League of Arlington to consider adopting a pet. Sushmita Mazumadar – Do you know your bus driver’s story? 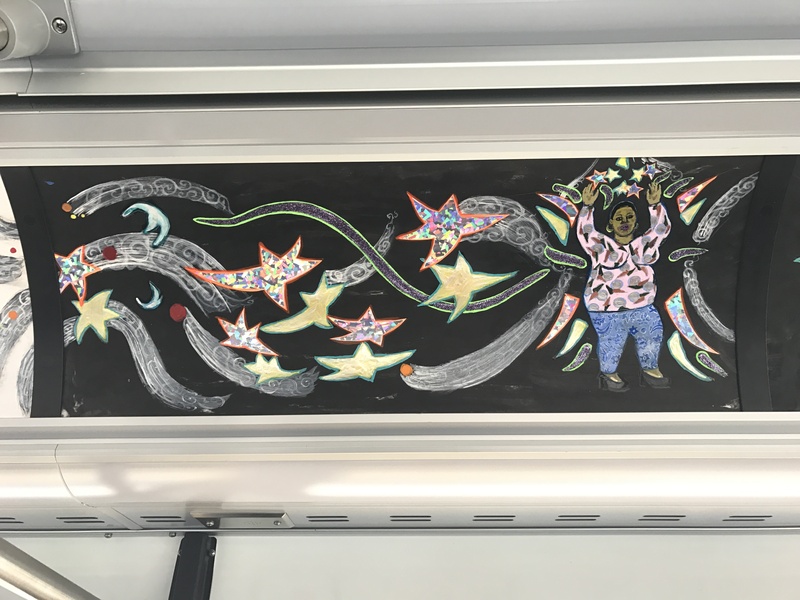 Known for her handmade storybooks, artist Sushmita Mazumdar collected words of childhood fears, identity, and family stories of the drivers who greet you daily. 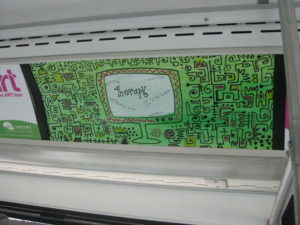 By turning their words into artwork, you see exhibited aboard this bus, the artist has made a part of their life visible to us all. Amy Hughes Braden – Artist Amy Hughes Braden is an Arlington native and Corcoran graduate who works as a painter and art teacher in the DC area. Her work utilizes portraiture to investigate a wide variety of issues, from family dynamics to the control of mass media in daily life. 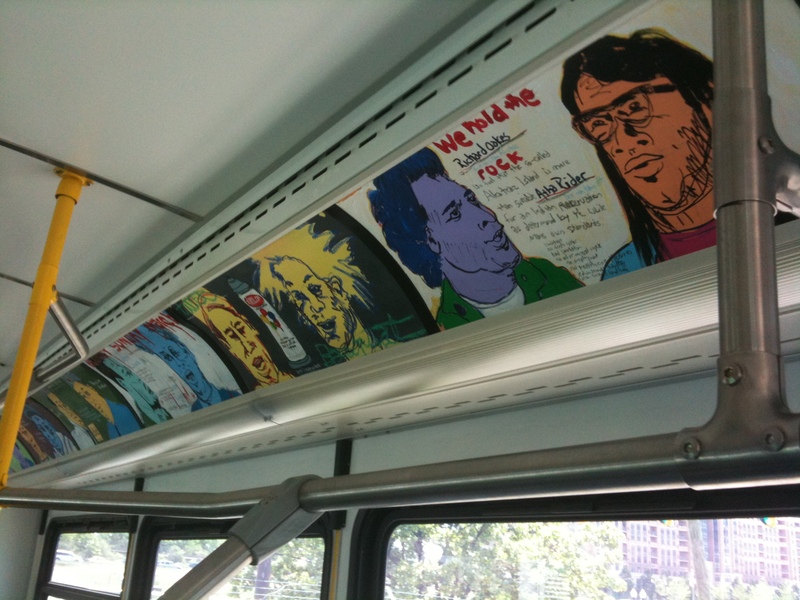 For the ART ON THE ART BUS, Braden has created further explorations in portraiture. Bridget Sue Lambert – Lambert photographs miniature furniture dollhouses and vintage dolls to simulate the emotional and physical clutter surrounding romantic relationships. 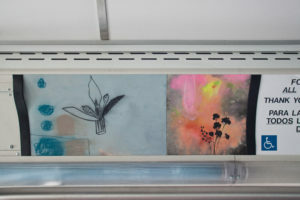 Created specifically for the Art on the Art Bus in her studio at the Arlington Arts Center on Wilson Boulevard near Virginia Square Metro, these constructed vignettes demonstrate the universality of human reactions and emotions. 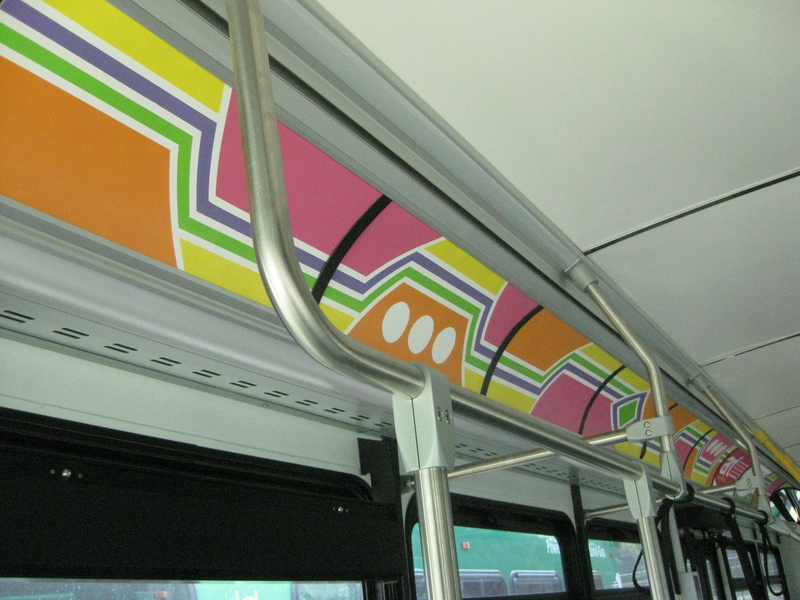 David Amoroso –Amoroso’s work explores the aesthetics and energy present in the imagery of popular culture and reflects his affinity for striking color combinations and bold design. These four portraits are of Arlington business owners who have used BizLaunch’s entrepreneurial services. Elizabeth Graeber – Graeber creates fun drawings and paintings that are inspired by visits to flea markets, farmers markets and fairs in the DC-area and beyond. 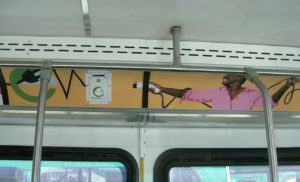 She is a freelance illustrator originally from Baltimore, MD, currently living and working in DC. 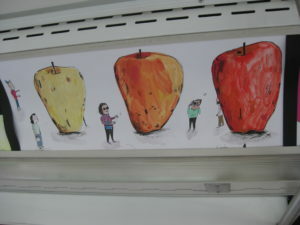 Her current project called Hand Drawn Bazaar is a blog dedicated to documenting her quirky discoveries and travels. 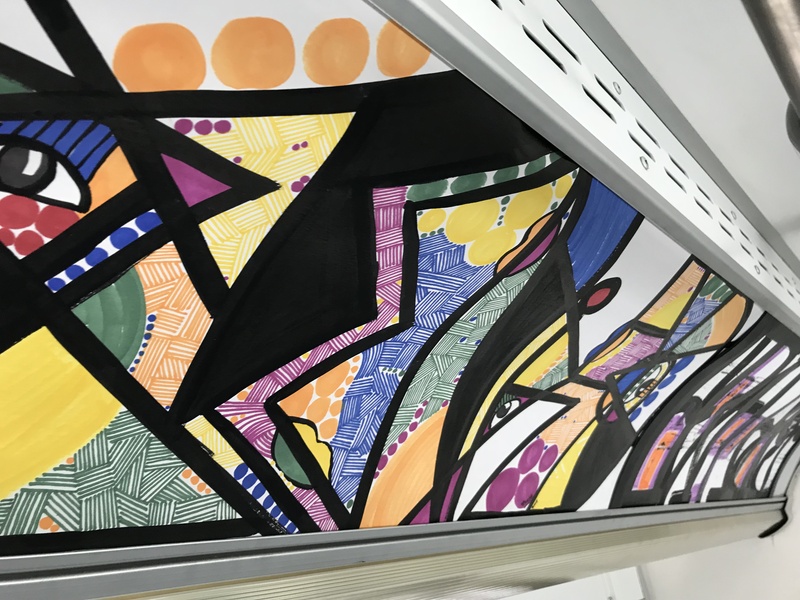 The works are made with pen, ink and watercolor. 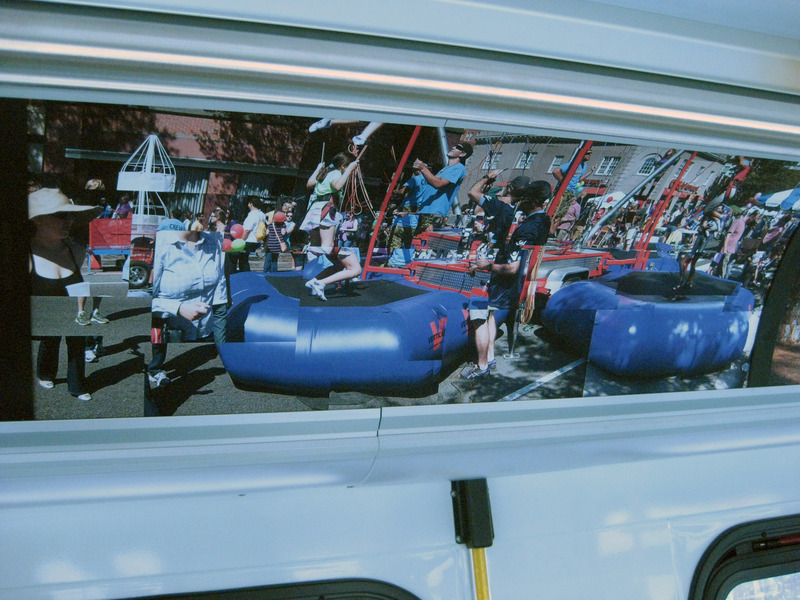 Jason Horowitz – Frame by Frame Is a series of collaged photographs that look at Arlington and the DC area from a new perspective. 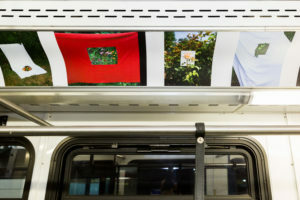 Taking up to an hour to shoot and later assembled digitally, the images celebrate Arlington’s diversity and energy by first fragmenting and then reassembling narrative time and pictorial space. 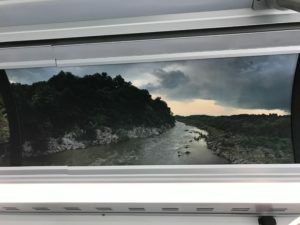 Jason has been an Arlington resident for more than 30 years and his photographs have been exhibited extensively throughout the world. 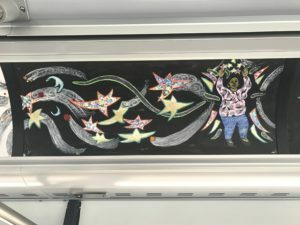 Jeffrey Smith – His installation of paintings for “Art on the Bus” is an opportunity to share a reverence for the lives of these fellow beings with the citizens of Arlington. The species depicted are each indigenous to the County, and can be found wherever one takes the time to look and listen to the natural world. These native plants and animals, which struggle to survive within the increasingly developed cities and counties of the region, are a reminder that life everywhere coexists by the grace of a balance now entirely in the hands of humans. Julia Christensen – Through her work, Christensen investigates the intersections of landscape, culture, and consumerism. 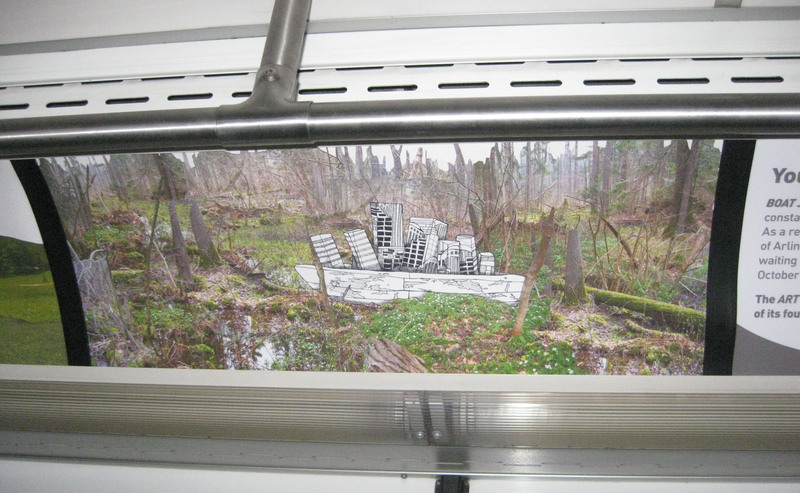 Christensen works across mediums in her art pieces, often combining photography, video, sound, and writing. For The Art on The Art Bus, Julia poses questions about possible future uses for vacant buildings in our midst. Julie Wolfe – Through her work, Wolfe investigates the intersections between beauty and conflict that exist within and across cultures. Her use of original iconography and color leads the viewer from immediate and aesthetically arresting images to an exploration of the various layers of seasons, life and time. 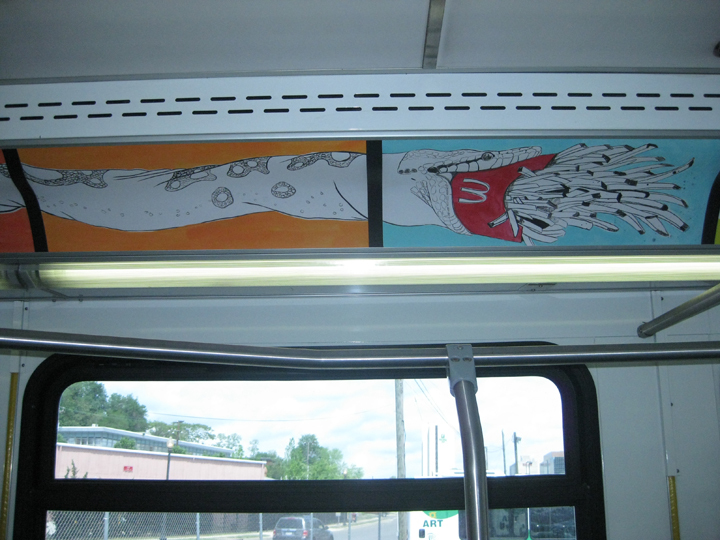 For the Art on the Art Bus, Julie focused her work on the flora and fauna of Virginia. Kate Stewart – Stewart’s work is heavily influenced by he landscape and makes direct and symbolic references to space, light and air. Similar t traditional Chinese ink painting, these ink drawings are a meditation on nature, but reveal the more sublime and chaotic aspects of nature, the antithesis of a spiritual ideal. Currently Professor or Art as West Chester University in Pennsylvania, she works in a variety of media including painting and sculptural installation. 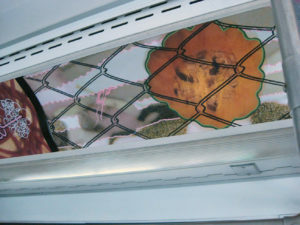 Khanh H. Le – Identity play a central role in KHÁNH H. LÊ’S artistic output. 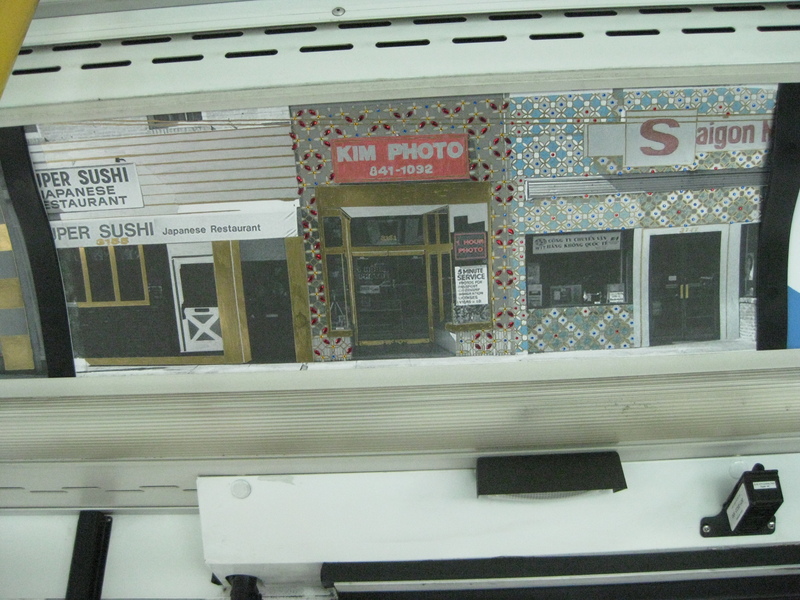 Little Saigon of Clarendon is a mixed-media collage work celebrating the Vietnamese community that once existed in Arlington’s Clarendon neighborhood. 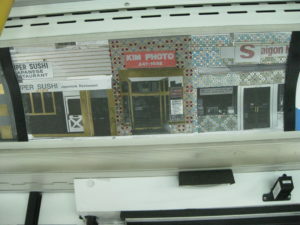 Borrowing from Michael Horsley’s photographs and using gold gelly roll pens, sequins, baubles, stickers and acrylic crystals, Lê transforms the buildings into a colorful, mixed-media townscape. 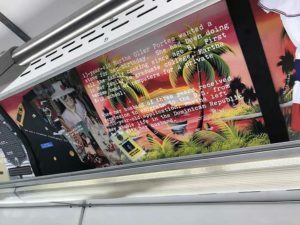 Because these scrapbooking materials have little perceived value, there is freedom to imbed culturally specific references, such as photography, with memories that are celebrated through the embellishments. 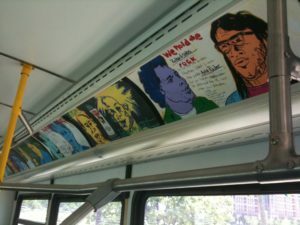 Maribeth Egan – The art created for Art on the ART bus began as images taken accidentally on her cell phone. Rather than deleting some of the photos as mistakes, she chose to look at them as mysterious blurry treasures to be built upon. Marissa Long – Arlington artist Marissa Long combines collage, sculpture and assemblage to create photographic works that offer a glimpse of the uncanny superimposed upon the banal objects with which we’re familiar. Collecting a varied assortment of found artifacts, hand-crafted forms and organic materials, Long devises playful compositions that teeter on the brink of Surrealism – subverting the notion of a rational, concrete reality in favor of one more indeterminate and perplexing. Modest items transform or stand beside alternate versions of themselves, inviting the viewer to reconsider their meaning. Negar Ahkami – Ahkami makes expressive paintings inspired by the rich patterns and textures of Persian ceramics and tiles. 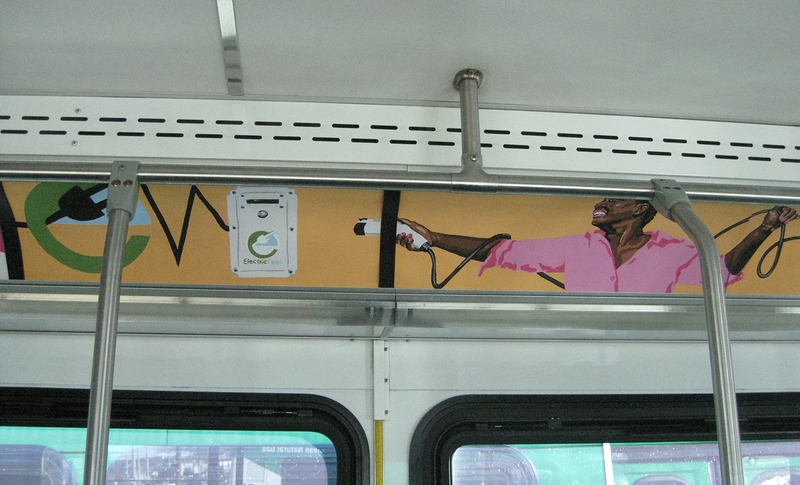 In this work, Ahkami revels in the escapism of dancing and the shared humanity and democracy found on the dance floor. This new work is a joyful departure from previous politically charged and angst-filled work. Here, Ahkami invites you to show up as your best self, and then shed your ego and troubles in a state of rhythmic flow. 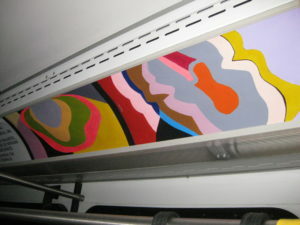 This work was made at Arlington Arts Center, where Ahkami is a resident artist. Rachel Schmidt – Boat Journeys is a series of drawings and collages that are inspired by the constant moving, commuting, and traveling that comes with living in an urban environment. 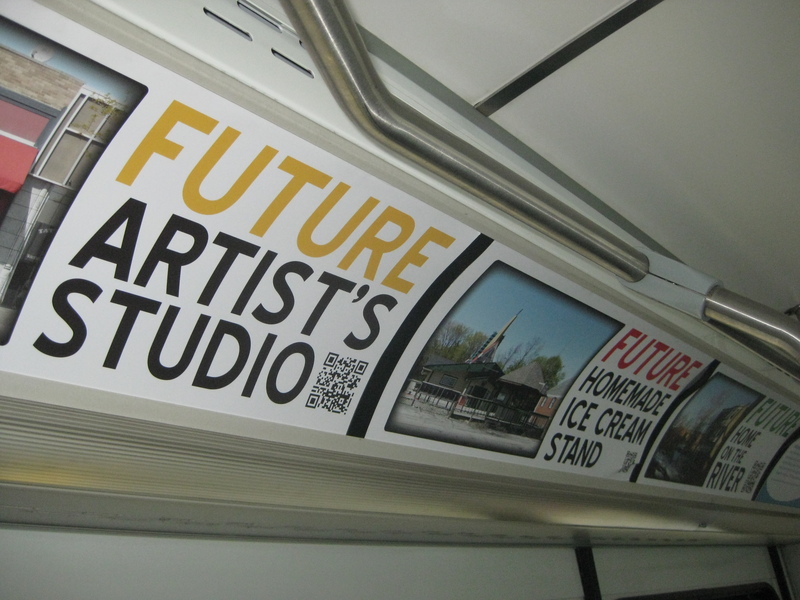 As an Artist in Residence at the Arlington Arts Center, Rachel regularly transverses the cityscape of Arlington and has found that fantastical spaces and stories are right in front of us, waiting to be told. Victor Ekpuk – Ekpuk is inspired by ancient African writing, graphic systems and symbols. 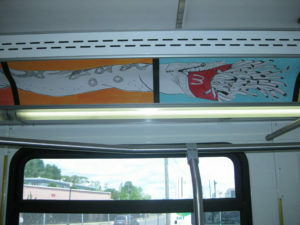 This set of drawings that was created in the Works in Progress Gallery at Artisphere for the ART ON THE ART BUS deviates somewhat from his formal work, in that he applied contemporary and familiar symbols to express the humorous side of our social and personal issues that bus passengers might recognize.